Near the radiant blue waters of Lake Baikal, in the lands where Mongolia, Siberia, and China meet, live the Buryats, an indigenous people little known to the Western world. After seventy years of religious persecution by the Soviet government, they can now pursue their traditional spiritual practices, a unique blend of Tibetan Buddhism and shamanism. There are two distinct shamanic paths in the Buryat tradition: Black shamanism, which draws power from the earth, and White shamanism, which draws power from the sky. In the Buryat Aga region, Black and White shamans conduct rituals together, for the Buryats believe that they are the children of the Swan Mother, descendants of heaven who can unite both sides in harmony. Providing an intimate account of one of the Buryats’ most important shamanic rituals, this book documents a complete Shanar, the ceremony in which a new shaman first contacts his ancestral spirits and receives his power. 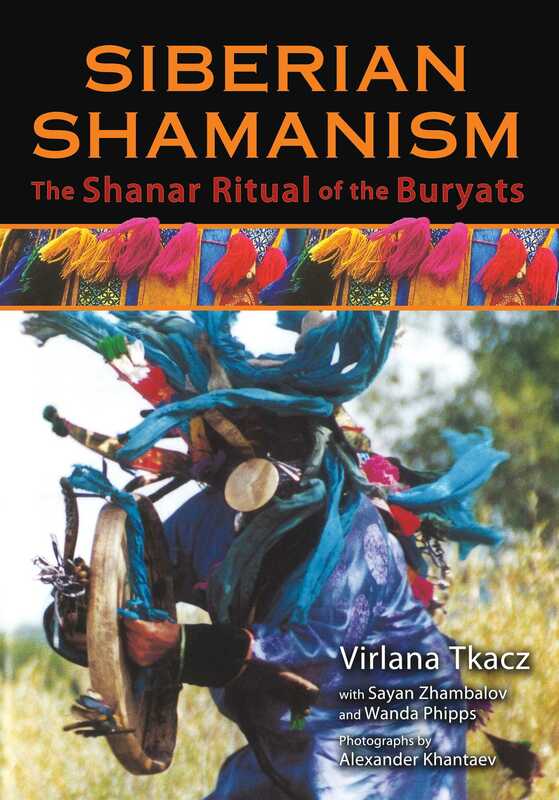 Through dozens of full-color photographs, the authors detail the preparations of the sacred grounds, ritual objects, and colorful costumes, including the orgay, or shaman’s horns, and vividly illustrate the dynamic motions of the shamans as the spirits enter them. Readers experience the intensity of ancient ritual as the initiate struggles through the rites, encountering unexpected resistance from the spirit world, and the elder shamans uncover ancient grievances that must be addressed before the Shanar can be completed successfully. Interwoven with beautiful translations of Buryat ceremonial songs and chants, this unprecedented view of one of the world’s oldest shamanic traditions allows readers to witness extraordinary forces at work in a ritual that culminates in a cleansing blessing from the heavens themselves. Mountain trees were pulled out with their roots. Mountain trees were cut at the root. Each leaf was made golden. Shaman Bayir Rinchinov told us that the sacred grounds for the ritual would be ready on Sunday, August 19, 2000. The appointed place for the ritual was a large grassy meadow surrounded by gentle rolling hills. There were no shrines or temples. Here in the "lap of Nature," as old Buryats say, everything has a spirit--not only people and animals, but also trees, rivers, and mountains. A shaman mediates between the world of humans and the world of spirits. The spirits of nature help him in this process. The tree that the Buryats respect and call their "family tree" is the birch. During a ritual the birch is a conduit between people and the world of the spirits. In special places large birches were dug out with their roots, and smaller birch saplings were cut down at the root. They were brought to the ritual grounds with all their branches and leaves intact. Here they were decorated and set into the ground in a traditional pattern, as an offering to the spirits. Two birch groves were set up. At the south end the men dug a large hole for a tall, thin birch. This birch was the Serge, or the Hitching Post. The shamans at this ritual were both Black and White. Black and White in this case does not mean good and evil, but rather defines two different traditions of shamanism. A Black shaman beats a drum while chanting and calls on the spirits of the earth. White shamans ring a bell as they chant. Black shamanism is believed to have arisen in the Lake Baikal area. The origins of White shamanism are less clear. Some scholars believe that White shamanism contains fragments of an old Mesopotamian religion, brought to this area thousands of years ago. Others point to the obvious influence of Buddhism. In the Buryat Aga Region of Siberia, where the borders of Russia, Mongolia, and China come together, Black and White shamans conduct rituals together. The Buryats here are Khori Buryats, descendants of Khoridoi Mergen and the Mother Swan. They consider themselves to be Swan people--descendants of Heaven who can unite the Black and the White. During this Shanar Black and White shamans took turns conducting the various rituals. The White shamans used the southern birch grove, while the Black shamans used the northern grove. Most of the shamans in Bayir's circle practice on both Black and White sides, but each shaman has a preference for one. Bayir, as the leader of the group, would usually choose the Black side, which is considered to be more powerful. The other Black shaman was Dulma Dashiyeva, a striking woman from Aga. The leader of the White side was the shamaness Seseg Balzhinimayeva. Bayir, Dulma, and Seseg, now all in their forties, started on the path to shamanism at the same time. Those were difficult times, since shamanism was forbidden under the Soviets. All religions were dubbed "the opiate of the people," but shamanism was considered a particularly odious form that prevented its "unenlightened practitioners" from joining the "progress on the road to socialism." Shamans were portrayed as insane or devilish. The anti-religion campaigns of the 1930s and 1950s were particularly harsh. In the Buryat Aga Region people tell many stories of shamans who defied the authorities, but eventually most were shot or disappeared into the labor camps of northern Siberia. Some shamans joined the exodus of Aga Buryats to Mongolia. Although Mongolia was a Soviet satellite state, the remote Buryat villages of Eastern Mongolia were far from government scrutiny. There the shamans were able to quietly continue their practices. With the easing of Soviet control Aga Buryats started to travel to these villages. Bayir, Seseg, and Dulma, who were then young shamans in search of a traditional mentor, were able to find an old shaman in a Buryat village in Mongolia who became their teacher. And so the ancient traditions, which had been in danger of being lost because of the seventy-year ban, were revived. Today times are good because people can openly display their belief in shamanism, but they are also very hard times economically. Seseg once taught kindergarten in her native village, but the government stopped paying teachers in remote villages. Seseg had to think about her family's survival. She decided to get a cow because, as she said, at least the children would always have milk on their lips. So Seseg, educated to be a teacher, now keeps a cow for a living and practices shamanism. Many other educated Buryat villagers were also forced by circumstances to return to their ancient traditional ways. In addition to Bayir, Dulma, and Seseg, there were several other shamans at the Shanar who were only starting on the path to shamanism. They served as assistants to the shamans during the ritual. There was Bato-Bolot, a middle-aged man who preferred to shamanize on the White side, and Tuyana, a young shamaness who preferred the Black side. Then there was the kindly elder Bolod-Akhe1 from the collective farms far to the south near the great lakes that border on Mongolia, and the beautiful Olya from Alkhanay who had only recently discovered her calling. The calling to become a shaman usually first appears as a very serious illness that seems incurable. It is known as shaman sickness. The person must acknowledge that the source of the illness is spiritual. They also must accept the fact that they will become a shaman and undergo a ritual before the illness disappears. The dedicating shaman at the Shanar was Volodya Zhaltsapov. He was the reason we were all there. He was the one who was bringing this Shanar to his ancestors. Virlana Tkacz, the recipient of two Fulbright Fellowships, is director of the Yara Arts Group in New York. Since 1996 she has worked with Buryat artists to create theater pieces based on Buryat stories, poetry, and songs.